My father once told me to be careful of what you ask for in life; you may accidentally receive it. I will spend a lot of time over the coming months trapping and relocating nuisance animals, such as raccoon, opossum, skunks, rats, mice and coyotes from property in the Farmington/Farmington Hills and surrounding areas. Since I started writing trapping stories I have received a lot of questions on trapping. One question in particular, I get asked the most relates to how I started trapping nuisance animals. The following is the story of how Trapper Ron came into existence, I hope you enjoy it. It all started about ten years ago in the driveway of my home in the City of Farmington. It was about 9:00 p.m. and my wife and I were attempting to remove the window sticker off of our brand new full sized van we had just purchased. I was standing on the passenger side with the door open scrapping the sticker off when two skunks appeared at my feet from under the van. I was in shock and feared moving. The skunks walked casually past my feet towards the backyard and squeezed under the fence. I slowly peeked around the corner of my house and watched them crawl under my deck. My wife, Kathy, insisted that I get rid if them for obvious reasons. I didn’t have a clue what to do, so I called the city for help. They said that as long as the animals were outside the home, they could not do anything. However, they did have a couple of live traps I could use, if I wanted to trap it myself. “No, you cannot shoot it, city ordinance does not allow some to set off a fire arm within the city”. After a second or two I asked, “Well, can I shoot it with my bow?”. The officer looked at me with a devilish grin and walked away. I took that to mean that I have a viable alternative, until I looked at the trap. The metal wiring of the trap was too tight to shoot it with a bow and arrow so I dismissed this option altogether. Later that evening, I set up the live trap in the driveway near the area of my deck where the skunks had entered the night before. I didn’t know what to bait the trap with so I looked in the refrigerator. The only thing I could see that might work was hot dogs. I grabbed a couple and threw them into the trap. Early the next morning, I looked out my kitchen window and to my surprise there was a very large skunk inside the live trap. My chest pumped up as I strutted down the hall to brag to my wife who was still sleeping. Kathy was very happy but wondered how and where I was going to get rid of it. The reality of this finally sank in as I drank a cup of coffee and watched the skunk from the safety of my kitchen. Many questions were running through my head; would it spray me, how far could it spray, how was I to get close to the cage, never mind opening the cage without getting sprayed, and how and where do I take it. After several cups of coffee, I remembered that I had a tarp in the garage. I mustered the courage to deal with the skunk by covering the cage with the tarp. I slowly approached the cage with the tarp as a shield and laid it over the skunk without further incident. I continued to wrap the cage with the loose ends of the tarp until I had the entire cage securely wrapped. Now that I had this hurdle jumped, I called my father for assistance. My father was still laughing when he arrived at my house; he was as clueless as I was on what to do. Fortunately he owned a pickup truck and we could use it to move the trapped skunk. My father, Erik my oldest son, he must have been around 5 years old at the time, and I piled into the pickup for our adventure. We slowly drove to the nearest park since I didn’t want the tarp to blow off the cage. Once at the park, I took the trap and sat it on the ground away from my father, my son and the truck. We talked it over for a minute until I got the nerve to reach inside the tarp to unlatch the trap door. When the door was securely open, I ran from it as fast as could. We waited for five minutes and the skunk didn’t come out of the cage. After ten minutes, I walked up to the cage and gave it a light kick and then ran. I was amazed that the skunk wouldn’t leave the cage. My father and I just looked at each other in puzzlement. Jokingly my father told me to go over and shake the skunk out of the cage. The look I gave him surely indicated that he was insane, but after waiting another five minutes decided what the heck.. I left my son by the truck and told him he was about to witness two grown men running from a small fury animal; we slowly approached the cage. I grabbed the rear end of the cage and tilted it so that the open end was pointing to the ground. The skunk still didn’t come out. I lifted the cage higher and still nothing. Then, in a moment of bravery, I picked up the cage and I gave it a good shake. Suddenly the cage got a little lighter. My father was already running away from me when I noticed that the skunk was on the ground at my feet. A split second later the cage was going one way, me another, and the skunk another. After my first experience. I continued to trap at night in an attempt to capture the other skunk. 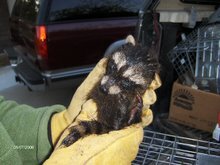 In the process, I caught two raccoons, an opossum and eventually trapped the remaining skunk. Work quickly spread throughout the neighborhood and I found myself doing favors for friends, relatives and neighbors. I continued to education myself on various trapping techniques eventually turning my new hobby into a business; the rest is history. Spring will soon be upon us once again and as it approaches we see animal activity begin to increase. Already, this year we have noticed a sharp increase in animal relocation calls for February and March. I believe this to be due to the inconsistent weather we have been experiencing.We have trapped and relocated dozens of animals, such as raccoons, opossum, skunks and coyote. We have also spent a lot of time performing animal and bird exclusion services.Exclusion calls from frantic homeowners always begin this time a year. They desperately want for us to solve problems with birds nesting in dryer and bathroom exhaust fan vents. Bird often enter unprotected vents to nest for the spring. Often venturing throughout the vent piping system birds can get stuck in bathroom exhaust fans.Vents are a wonder spot for birds to build nests and protect their young. They are very difficult for predators to enter and they typically are fairly high from the ground. Unfortunately nesting birds can be a problem with proper vent ventilation, vent operation,and odors entering the home. In addition the scratching, chirping and other noises birds make can be very annoying.My mother-in-law, Ruth, tells a story where she was doing her hair in the her bathroom when a very disturbing event happened. While brushing her hair, she saw something fall from the bathroom exhaust fan. To her horror, from the reflection in the bathroom mirror, she saw several maggots on her shoulder. Apparently, a bird had entered through the outside vent, traveled through the pipes, got stuck in the bathroom fan and died. A typical bird exclusion call for us is to assess and inspect each vent for bird activity. Some homes can have vents as high as 25 feet off of the ground, requiring a sizable extension ladder. Nesting materials inside the vents are thoroughly removed and cleaned. We also inspect pipes to ensure that all connections are intact.After cleaning we install a bird cover over the existing vent. Vent covers are securely attached with four stainless steel screws. Once the bird cover is installed we move on to the next vent.This process is not rocket science and is an easy preventative procedure that can be done by most homeowners. This is definitely a procedure that should be done to prevent birds from gaining access to the interior of your home. My son, Erik, being a practical joker at times, got me one day while installing a bird vent. He was up the ladder about 15 feet cleaning a vent. He was pulling handful after handful of nesting materials and dropping it below. The bag I was using to collect the dropping was filling up, so I decided to go to the truck and get another bag. My devilish son could not resist himself and as I turned the corner of the home, he quickly slid down the ladder and laid down on the grass. When I returned, I almost had a heart attack when I noticed him on the ground. I couldn’t believe that he fell and since he wasn’t moving I thought for sure that he was seriously hurt. I dropped the everything and ran over to him. It didn’t take very long for me to figure out that he was all right since he started laughing hysterically. I was pretty upset at him for a while, however, I give him credit for holding a straight face for as long as he did. As always, anytime you require a professional trapper, make sure they are licensed with the Michigan Department of Natural Resource and insured. Cost varies greatly so do your homework and call several trappers and compare pricing for the services offered. Ron Baker is the owner of Trapper Rons Humane Animal Removal & Relocation Services located in Farmington Hills. He assists homeowners and business with all wildlife nuisance issues in Farmington and surrounding cities. He can be reached at (248) 426-0036. Trapping is never boring. One day you may trap raccoons and opossum, the next day coyote and fox. Some days, however, you may have the oddball call. Not to long ago I received a call from a man in an affluent subdivision. He told me that someone must have dumped chickens in his yard and he wanted them removed. Not knowing how to react to the situation and looking forward to a new challenge, I accepted the contract. Upon arrival I surveyed the area and noticed that the chickens had migrated into the attached garage. Before contacting the home owner, I walked slowly into the garage and pushed the door opener mounted on the wall. As the door nosily closed, I stood on guard to ensure that no birds would fly or run out. Once the birds were safely and securely entrapped in the garage, I made contact with the homeowner. It was a mystery to him as to why the chickens suddenly appeared two days earlier. Not only did the homeowner not want the birds on his property, he didn’t care what happened to them. I counted four hens and two roosters. They were the most beautiful chickens I had ever seen. I don’t know what kind they were but they were tall white and majestic. They reminded me of the rooster on the Kellogg’s Corn Flakes cereal box. After thinking about this situation and formulating a game plan, I decided that the only way to nab the bird was to corner each one and grab it by hand. This was a great idea in theory, however, not as easy as it may sound. After a few minutes, I finally had the first bird cornered. All I had to do was reach out and grab it by the neck. I prepared myself, moving my hand slowly towards the neck. I was a mere inch from success when the chicken started cackling and fluttering its wings. It flew up and over my head, startling me in the process. I tried knocking it down with swinging motions of my arms. It took about a half an hour, but I finally captured all six birds. As I caught each bird I placed it into a live cage. I had three cages, so I placed two birds in each.With the birds in the back of my truck and the homeowner happy, I left with another fun story to tell my readers. While driving away, I started to call some associates of mine to see if they would like to take the birds off of my hands. I only had one person that was interested, John lived in the country and his son wanted to raise the chickens. In discussing the logistics to bring John the birds, he asked how the birds were stored. He expressed concern when I told him that I had three cages with two birds in each. John, told me not to put two roosters in the same cage since they will fight to the death. Upon hearing this I immediately pulled over to check. I had no idea that roosters would fight and I couldn’t remember if I put two roosters in the same cage. The next morning I met with John and gave him one rooster and four hens. Trapper Rons Humane Animal Removal & Relocation Services located in Farmington Hills. He assists homeowners and business with all wildlife nuisance issues in Farmington and surrounding cities. He can be reached at (248) 426-0036.